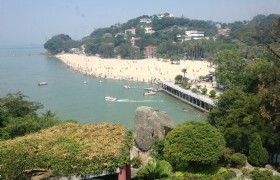 Coach tour to the Nanjing and Yongding to see Tulou, Free time on the beach of beautiful Xiamen. 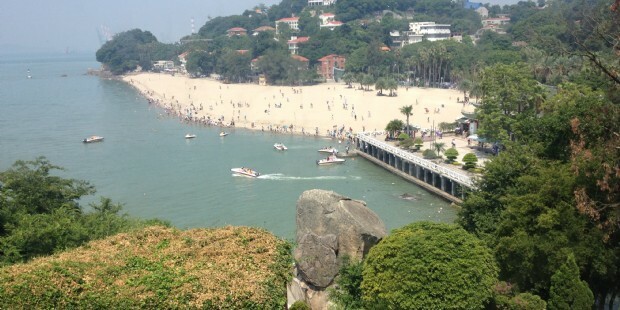 Leisure day in romantic island of Gulangyu. 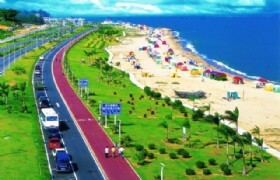 This is a perfect combination package of holiday in Xiamen. In these 4 days, you will have a private coach with an expreineced driver and an English speaking tour guide. It is an escorted tour to visit all famous local historical relics and natural attractions in this area. Airport pickup and transfer to hotel. Free time for the rest of the day. 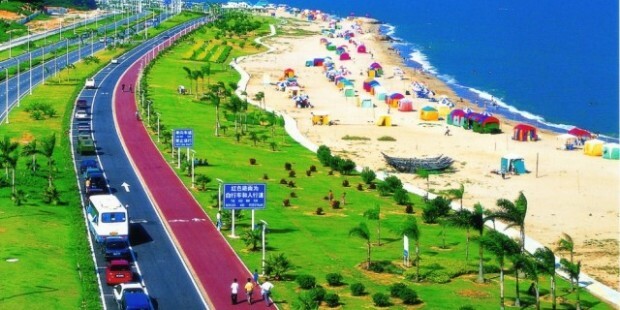 You hotel is near the ZengCuoAn Beach, a place where we highly recommend you to spend your first night on the beach of Xiamen. Huandao Road in Chinese. From Xiamen University to International Convention Center. It is about as ocean-front as you can get. The view is splendid. Pick up at 08:30AM. Take a 3-hour scenic drive to Shuyang in Nanjing County in Zhangzhou City, visit Tianluokeng Tulou, Yuchang Lou, and Taxia village, an exquisite Hakka village. 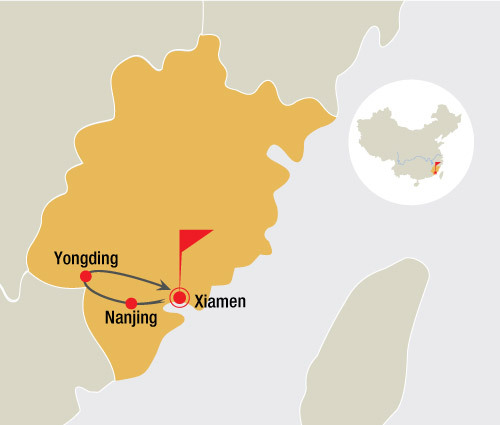 Then transfer to Yongding County in Longyan City, visit Zhencheng Lou in HongKeng village in the afternoon. We will stay overnight in Fuyu Lou cluster in HongKeng village. 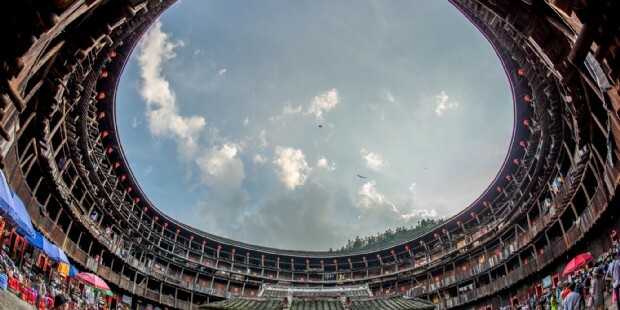 On July 7, 2008, Tianluokeng tulou cluster was inscribed as one of 46 Fujian Tulou World Heritage Sites. Compare with clusters in HongKeng and Gaobei, Tianluokeng Tulou Cluster is not so polluted by toursim. It is located in Xiabanliao village in Nanjing. It is a five-storey clay built in 1308 Yuan dynasty by the Liu clan. Yuchanglou is also nicknamed as the “leaning building”, because the vertical wooden post structure is not straight, but leaning left and right. It was constructed like this mainly due to a mistake in measuring the building material. But in spite of this error, this tall tulou has survived for the past 700 hundred years. Yuchanglou is 36m in diameter and has five storeys, with 50 rooms on each floor. The ancient village is located in the west of Shuyang Town in Nanjing, The village has a long history dating back to 1426. Now there are over 300 households in the village. The clay buildings in Taxia Village are built evenly along the banks of the river passing through the village. The tulou buildings in the village have various kinds of shapes – circular, square and oval. Located in Hongkeng village, Hukeng township of Yongding County. Inscribed as UNESCO World Heritage 1113-002. It was built in 1912 by the descendents of a rich tobacco merchant. 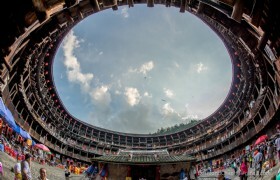 Zhenchenglou is a double ring tulou, its outer ring is four storeys high, total 184 rooms, the inner ring is two storeys with 32 rooms. The outer ring was partitioned into four segments according to Bagua concept of Chinese Fengshui. It is located in a traditional 130 years old Hakka architecture of Fuyulou Cluster, originally 160 rooms. The villager renovated 20 rooms with simple facilities of bed and breakfast. The rooms are clean and tidy. The cluster is quite near the famous Zhenchenglou Cluster. After the crowd of tourists leaves, you will find out the life in cluster keep the same way as hundreds of years ago. In the morning, Visit Chengqilou in Gaobei village. Then transfer to the Nanxi tulou clusters. Have lunch in a traditional tulou of Yanxianglou. Transfer back to Xiamen after the tour. Gaobei village is 15 minute drive from HongKeng. The main clouster we will visit is Chengqilou, nicknamed "the king of tulou", It was built in 1709. Inscribed as UNESCO World Heritage Site 1113-003 in 2008. It is massive round tulou with four concentric rings surrounding an ancestral hall at the center, the outer ring is 62.6 metres in diameter and four storeys tall, 288 rooms, with 72 rooms on each level, circular corridor on 2nd to 4th floor, with four sets of staircases at cardinal points connecting ground to top floors. Chengqilou has two main gates and two side gates. 15th generation Jiang clan with 57 families and 300 people live here. At its heyday, there were more than 80 family branches lived in Chengqilou. 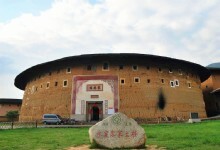 A round earth building located in Xin`nan Village. It was built in 1880. The name of Yanxianglou means that "to multiply descendants to keep the clan prosperous and flourishing; to study to keep the literary family passing from generation to generation". The interior has a luxurious layout and scholarly atmosphere, and the gate and fence were designed to imitate a dragon's head and body. Pick up from hotel in the morning, transfer to the ferry for a 7-minute boat trip to Gulangyu Island. Take a peaceful walk and appreciate the buildings before visiting Hi-Heaven, the largest old villa on the island where you can enjoy ancient South Music performance and traditional Puppet Show, also visit Shuzhuang Garden, a beautiful seaside garden and the famous Piano Museum. In the afternoon, visit South Putuo Temple, the most famous Buddhist temple in Xiamen. Take photo outside the beautiful campus of Xiamen University. Later today, transfer to airport for flight home. It displays a collection of over 200 pianos from different nations in the world, some of which are over a century old. When the Treaty of Nanking was ratified in 1842, British forced China to open its door to outside world, Xiamen is a thriving port city once again. More and more Europeans live in Gulangyu. The study of piano proved more popular in 1920's, and some of the country's most skilled musicians came from Gulangyu. Situated on 515 Siming South Road, The NanPutuo Temple faces the sea. It is the most famous temple in Xiamen. The vegetarian Cuisine in Nanputuo Temple is something you can try for dinner tonight. Famous dishes include taro paste with dried seaweed, luohan (a kind of fruit used in Chinese medicine), corn with pine nuts, tempeh stuffed in bamboo, and roasted, marinated flowers. After tour, you will be transferred to airport or bullet train station.